The graduate will demonstrate knowledge of the basic medical sciences; clinical skills; and the ability to acquire, manage, and use current information for clinical decision-making and problem-solving in the care of individual patients, family members, populations, and systems of care delivery. 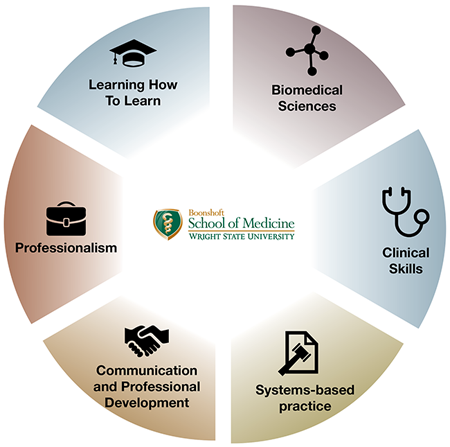 The graduate will demonstrate knowledge of the ethical, social, economic, and cultural influences upon the health of and health care delivery to patients and patient populations, and will be able to propose realistic approaches to improving the health of an individual patient and for a patient population. The graduate will be able to identify the diverse factors that influence the health of the individual and the community; identify the socio-cultural, familial, psychological, economic, environmental, legal, political, and spiritual factors impacting health care and health care delivery; and be able to respond to these factors by planning and advocating the appropriate course of action at both the individual and the community level. The graduate will demonstrate the ability to establish a professional relationship with a patient, build a comprehensive medical and social/personal history, conduct either a focused or comprehensive physical examination as indicated, construct a differential diagnosis, and recommend a course of treatment consistent with current standards of care. The graduate will demonstrate the ability to communicate (written and oral) clearly, professionally, and effectively with patients, their family members, health care team members, and peers. The graduate will demonstrate the capacity to listen to and respond appropriately to constructive feedback from peers and teachers, as well as give constructive feedback and evaluation to peers and faculty as requested. The graduate will be able to identify personal strengths and weaknesses in the care of patients and working with colleagues and allied health professionals, and, if indicated, demonstrate the ability to make changes in behavior that facilitate collaborative relationships. The graduate will demonstrate through the period of undergraduate medical education a pattern of responsible behaviors consistent with the highest ethical standards of the profession: honesty, confidentiality, reliability, dependability, civility, and punctuality. The graduate will demonstrate a commitment to leadership and the advancement of new knowledge.